Google Adsense can also be defined as an application primarily designed to serve various ads that are posted online. Website owners can use this program with an aim of displaying images, video and text ads into their contents. Because the program is developed and designed by Google, you have an assurance that all the ads are closely scrutinized by them. A website owner can start generating profit from the ads either by per-click or per-impression basis. 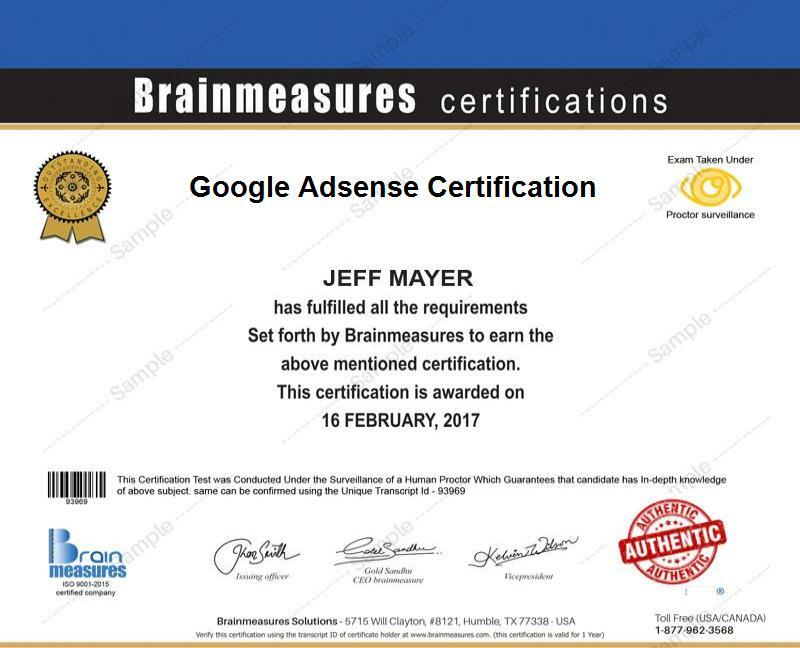 If you want to fully understand how Google Adsense works and how you can earn money through it, then you should consider enrolling in a Google Adsense certification program and this is something that you can get from Brainmeasures. Because Brainmeasures is a trusted and well-renowned online certification and testing company which is also ISO certified, you have a guarantee that its Google Adsense course is comprehensive enough that it will never fail to let you understand everything about the subject. You will know exactly how the ads are posted into the contents of your site and how you can generate profits from the ads. You will also know that Google Adsense is extremely useful if you are planning to take advantage of the best online marketing campaigns. As a means of determining whether you understand everything which is taught in the Google Adsense certification course, an online advertising test is included in the program. Passing the Adsense exam is considered to be the last step towards getting your skill certificate. The Google Adsense certification program from Brainmeasures is designed in such a way that it can benefit a wide array of individuals and professionals in the business industry. This is most suitable for individuals and professionals who greatly desire to become successful when it comes to managing ads. You can also expect the Google Adsense certification course to be valuable for people who are working in the marketing and sales departments of an organization as this will let them learn the basics of successful ad management which can work in significantly boosting sales. Because the program is offered by Brainmeasures, you have an assurance that you will be getting the most comprehensive training and the most accurate marketing resources linked to Adsense. The good thing about this is that you can expect your certification to make your resume look even better. Google Adsense certification holders can also be expected to earn a decent sum of money. Being an expert in Google Adsense will allow you to earn around $15-$20 per hour. On a fixed basis, your annual salary can be expected to range from $58,000 to $75,000. You can also receive bonuses of $15,000 to $17,000 if you are already a certified Google Adsense expert.